A favorable financial conditions on the back of rising GDP is fuelling the growth of the meat sector in Japan although at a slow rate, which is expected to grow at a compound annual growth rate (CAGR) of 1.2% from JPY2,685.5bn (US$24.5bn) in 2018 to JPY2,857bn (US$27.9bn) by 2023, says GlobalData, a leading data and analytics company. 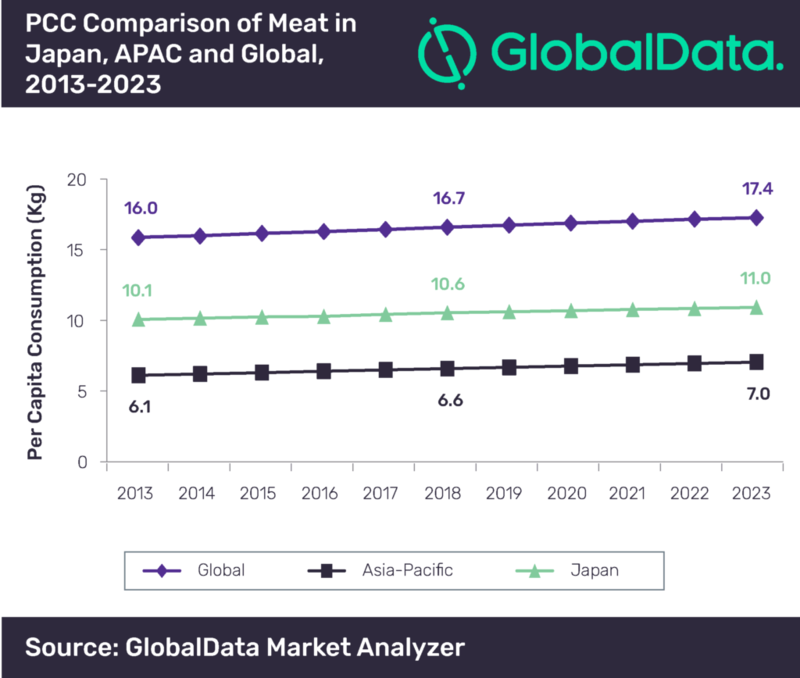 GlobalData’s report, ‘Country Profile: Meat in Japan’, reveals that fresh meat available in retail counters held the largest value share of 55.1%, followed by chilled raw packaged meat – whole cuts, which accounted for a value share of 15.2% in 2018. Furthermore, GlobalData predicts the frozen meat category to grow at the fastest value CAGR of 1.4% during 2018–2023, followed by chilled raw packaged meat – whole cuts category at a CAGR of 1.3%. The report further points out that Japan’s value share in the Asia-Pacific (APAC) region, which stood at 8.5% in 2018, is expected to decline to 8.1% by 2023, mainly due to the projected faster growth of meat products among other leading countries in the region, such as Hong Kong and China, during the forecast period. Furthermore, the per capita consumption (PCC) of meat in Japan is forecast to increase from 10.6kg in 2018 to 11kg by 2023, above the APAC levels, but below global levels.